4. Work together. Many hands make light work. 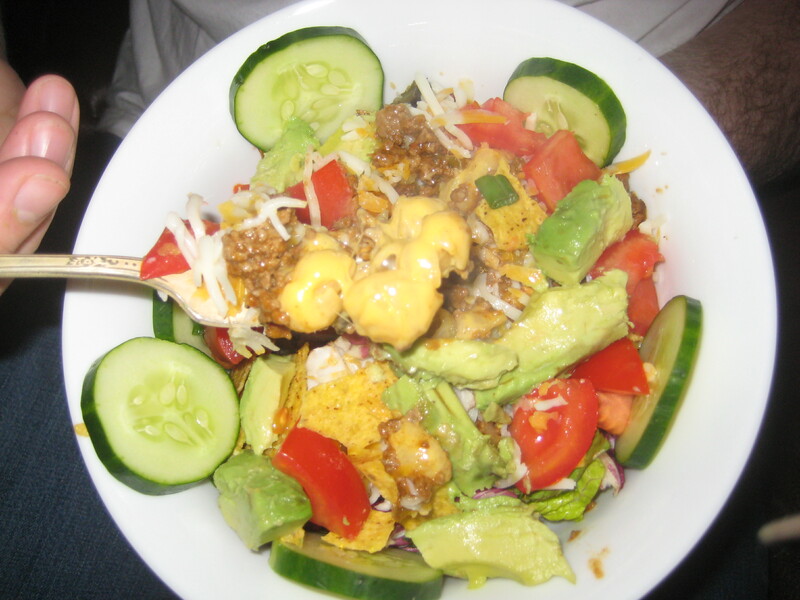 Tonight, the stars aligned over our kitchen, and a very easy, very craveable meal was born, which is best described as a Taco Salad – Mac and Cheese Mashup. Pictured below, is the vegetarian version. It was darned good. I made the Mac and Cheese and added a a nice creamy scoop to our bowls, the rest was leftovers. Leftover magic! We had tacos last night, and so we reheated the ground beef taco meat, and the vegetarian Taco Filling by Fantastic Foods** and added a scoop to our respective bowls. Bjorn assembled the fresh taco fixings: Chopped tomatoes, and avocado, cucumber, chopped green lettuce and radicchio, chopped green onions, salsa, a sprinkle of Monterey Jack cheese and a few crumbled chips. It was GREAT. And by great I mean yummy, creamy, and indulgent, and I dare say, somewhat complex, since the meal consisted of two distinct dishes that usually only end up on the same plate at a pot luck. It met requirements for a meal that needs to satisfy, be quick, use what we have, and require very little cleanup and make us happy to eat at home. And now, I even crave it when we aren’t in need of a quick fix. If you aren’t morally opposed to eating Velveeta 2% Shells and Cheese, and you need a quick and tasty supper, give this mashup a try. *If a person who wrote a paper in college entitled The Kraft Dinner Connoisseur wasn’t destined to be a food blogger, I don’t know who is. I got an A. **Yowza. For a person who believes in the health benefits of from-scratch home-cooking and avoiding preservatives and commercial foods, I’m really showing my convenience food-using stripes in this post. I stock a few convenience foods that we eat purposefully because they are delicious and they make life easier. 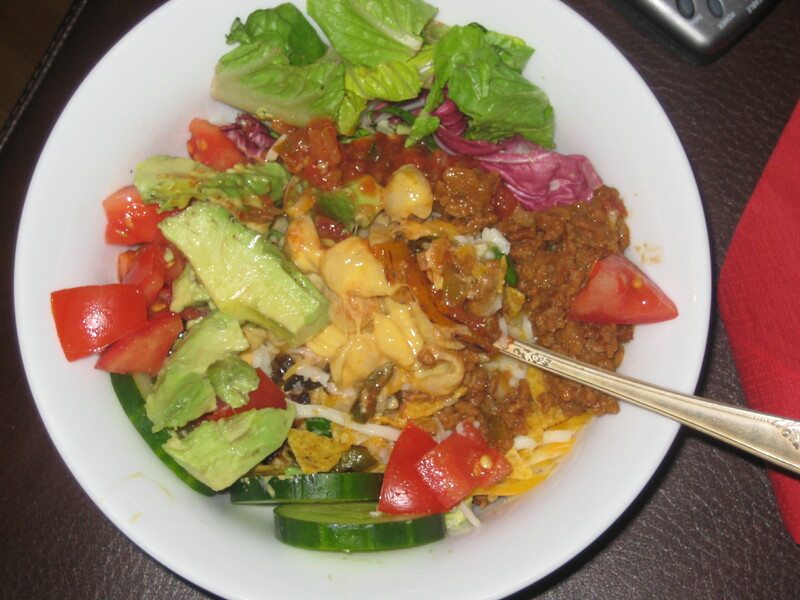 This entry was posted in Quick, Simple, Supper and tagged Kraft Dinner, Macaroni and Cheese, Mashup, Taco Salad, Velveeta 2% Shells and Cheese by Our Way to Eat. Bookmark the permalink. Mac and cheese is always a hit with everyone. I love mac and cheese and love to try new recipes whenever something new looks good, and this looks good!